Bayern Munich pummelled Werder Bremen 6-0 last night, proving they’re no worse a side under Carlo Ancelotti than they were under the stewardship of new Manchester City boss Pep Guardiola. We normally wouldn’t post about the German’s triumph, but Xabi Alonso, a favourite Anfield son, scored an absolute pearler that we simply couldn’t ignore! Picking the ball up around 25-yards from goal, the 34-year-old Spaniard, who’s been a starter for Ancelotti so far, unleashed an arrowed rocket into the top corner of the net. 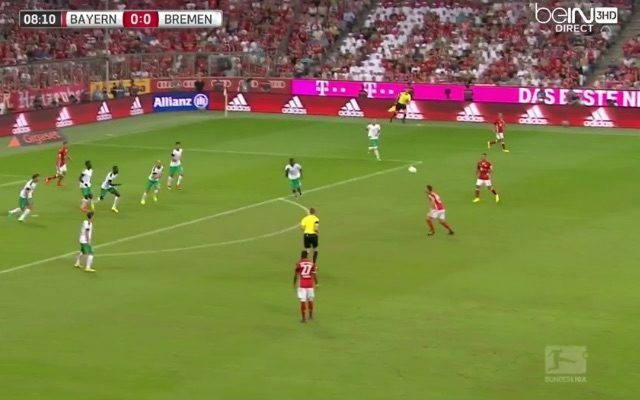 Xabi Alonso scored this filthy goal for Bayern last night.